I have a bit of a case of "the Monday's" today. I was not quite ready for the weekend to be over yet. Also, every "pose" was all wonky, images are all grainy ugh. O well. :-) Luckily, the detail image at the bottom came out ok.
On a good note, I do really like these pants. They are a corduroy, but not a plush one - they are twill with very fine wales. 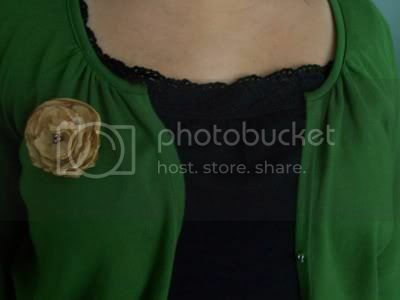 Simple but cute, and i love the brooch! Oh I don't think your pics turned out bad...and I LOVE a good pair of cords! You look fab! bianca, i had the same problem yesterday. every pic looked awful,except the ones of the seahore. I guess he wanted center stage (smile) Love your outfit. Have a great day...was tuesday any better for you???? numisur - thanks for stopping by - I hope you do come back! Watergirl - Me too! I have a pair of the plushy cords too - for fall/winter. Tuesday was a lot better! Thank you! !